Ants are everywhere – especially in Florida! Our climate is ideal for a variety of ant species, including Carpenter ants, Pharaoh sugar ants, Fire ants and Ghost ants, among others. Ants are a common problem in homes and businesses in Tampa, St. Petersburg, Naples, Miami, Palm Beach and other areas across Florida. So, what can you do when ants find their way into YOUR property? That’s easy – call the experts at Suncoast Pest Control! One Call to (800) 270-3086 is all it takes to eliminate your ant problems and give you peace of mind. Each type of ant requires a different treatment method. We’ll dust, bait or spray depending on the type of pest you have. Keep in mind that, when you see one, there may be hundreds of thousands (possibly millions) that you don’t see. We service areas throughout Florida, with professional technicians in Tampa, St. Petersburg, Miami, Palm Beach, Naples and nearby areas. We’re the ant experts! We can eliminate ant problems both indoors and outdoors. 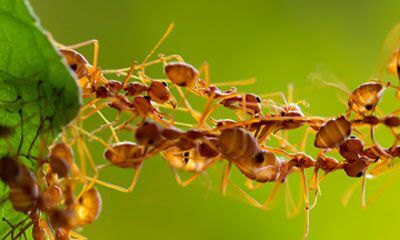 Ants can get into almost any space, and a swarm of ants can be quite disconcerting when you discover them. Don’t take chances with ants – Suncoast Pest Control will eliminate the problem quickly, safely, effectively and efficiently. Don’t wait for the problem to get worse – call today! Suncoast Pest Control proudly serves residential homes and commercial businesses in St. Petersburg, Largo, Clearwater, Tampa, Brandon, Bradenton, Sarasota, Cape Coral, Naples, Fort Lauderdale, Miami and surrounding areas. Fill out the form to your to the right to schedule a free at-home or in-office inspection, or call 1-800-270-30861-800-270-3086.